This post is for anyone who feels they no longer “fit” in some vital part of their life. Even if you’re ambivalent about religion or spirituality (I’ll be relating my experience with surviving a crisis of faith)—or even if your experience of spirituality has only ever brought you joy, you can probably relate to the feeling that you no longer fit within confines that were once welcoming and familiar. What do you do when you realize that you don’t fit within your own life? I’ve had an inborn affinity for spiritual things since I was a young child. This natural sense of devotion was magnified by my upbringing in an active religious home where our family identity was largely (okay, almost entirely) defined by our church membership and beliefs. My spiritual beliefs and the teachings of the church guided my life, and I’ve met some of my dearest friends there. My beliefs have brought me genuine comfort in times of grief, abiding peace when facing death, and clear perspective when troubled. I met my wife—the single most important person in my life—through our church. Yet for all these blessings, my relationship with the church (colored by my own perceptions and experiences) has also brought me great pain over the years, and especially within the last decade. Hearing the spiritual and emotional crises of others, day-in-and-day-out, in my work as a Marriage & Family Therapist has also taken a toll, although I’ve never regretted my choice of profession (keeping an open heart is really important to me). Though I always encouraged people in their honest inquiry and in their search for faith, inwardly my own questions grew in intensity over the years. As I mentioned in a previous post, this struggle crescendoed to into an almost unbearable crisis last fall. I felt miserable. While my soul hungered for spiritual nourishment, my weekly experience at church seemed mostly to magnify the things that brought me pain: the apparent contradictions between some church teachings and church practice; the frequent over-emphasis on “programs” at the expense of the essential (I do realize that identifying what is “essential” is subjective); and a cultural slide within certain elements of the church toward fundamentalism: ideology without empathy, and the prizing of dogma over people. These issues seemed to put God inside a box where He didn’t really fit. Something in my life didn’t fit in the church anymore—and I was terribly afraid that “something” was me. Did I no longer belong in the community I’d lived in for all of my life? Was there room for me, with all of my questions? Did I need to leave the safety of my tribe (with all of its goodness, memories, and richness) to keep my integrity and rescue hope for a more peaceful relationship with God? Staying seemed like a sentence to death by dissonance; yet leaving would bring a loss so deep that it could not be soothed. Connection, attachment, and love provide the foundation for everything I believe. Leaving my community would create an immense hole in my heart. My experience as a Marriage & Family Therapist tells me that many (if not most) of us face this sort of dilemma at some point in our lives—even if the struggle isn’t focused on spirituality. Maybe you’ve felt trapped in your career; maybe a relationship that once was sweet now feels suffocating; maybe you’ve lost sight of your calling or peace or dreams in pursuit of “success.” Maybe you’ve just been caught up in the busyness of life, and you woke up one day no longer recognizing your own heart. Maybe someone or something (a parent, a friend, a church, a belief) that once provided you with safety transformed nightmarishly into a source of pain and betrayal. We’ve all had that feeling, right? That feeling that we needed more room to grow, more space to move, than our current situation, relationships, habits, or beliefs seemed to allow. If my experience with my clients holds true, there isn’t a one-size-fits-all answer for what to do in those situations. Sometimes people have to leave; they have to make a break and let something end in order for something better to be built in its place, even at the cost of pain. But sometimes people need to stay, so they can expand, reconcile, heal, and work to find change within their circumstances. All I knew was that something had to change. And change it did—but (here’s the miracle of it) without the agony or struggle that had come to characterize my experience of church. The rescue of my faith and my life in the church began in a way I didn’t expect. It began when I met a new friend who talked about God in a lovely, open way, completely unencumbered by the things that weighed me down. My friend (who is not a member of the same church as me) also suggested that I read some writings from a 14th century Persian poet, of all things…. Intrigued by the idea that I didn’t have to struggle to figure things out (at least not now), I began trusting God again. I began to relax. I began to let go of my need for everything about God and the church to fit (right now!) into a coherent, tidy package. 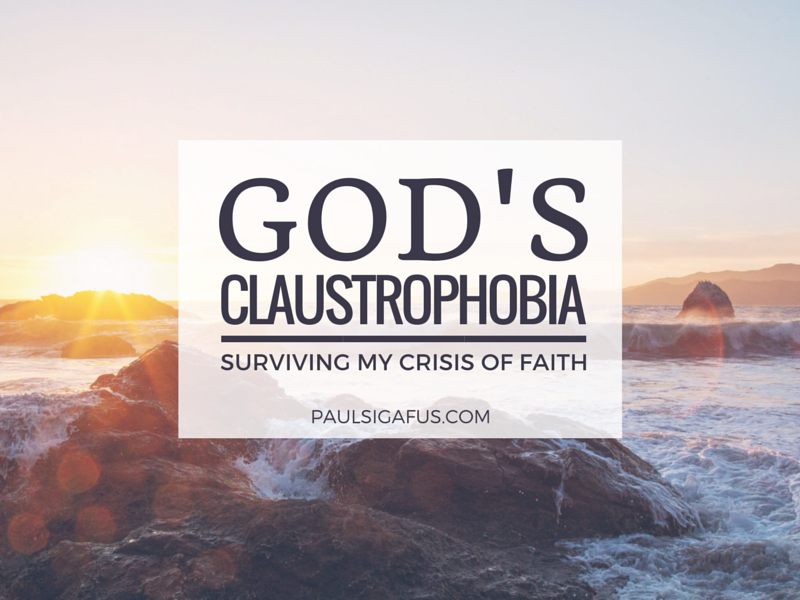 God is claustrophobic. He is expansive enough that he doesn’t fit in a small box. I needed to stop cramming Him in there. He needs a bigger space, a wide-open field. My search for God through struggle was like looking for a sunrise from the inside of a shell—I needed to break out in order to again behold His beauty. Looking for God inside a box of dilemmas was a distraction. As long as I was in turmoil about my issues, I would remain distracted from focusing on the work I have to do in the world, and from discovering God. I discovered that the loving, joyful, playful God (for whom I’ve always longed, and who isn’t plagued by contradictions) was already waiting for me—on the outside of my box of questions. I needed to put it down to take His hands. By the way, I’d be really sad—and a little angry—if anyone were to twist my intentions and use my words either to minimize someone else’s struggles (e.g., “Just do what Paul did—stop questioning—and you’ll be happy!…”) or to push them away from their faith or commitments (e.g., “Just leave your faith, your marriage, your job; happiness is outside of the box!”). So don’t do that, please. People have to search their own hearts and find their own paths, and it’s likely they’re more in need of our caring than our “expert” advice. None of us need more judgement; most of us are too judgmental with ourselves already. So if you share this, share it humbly. My questions are still there. The same annoyances and contradictions still try to take me hostage. But I know that for now, spending much energy on those things is a distraction and a waste of my time. I’d rather devote the precious days and hours of my life to things that bring connection, joy, and peace: my relationship with God, receiving His loving kindness, and making a difference in the world around me. This new take on God is also freeing me up; I feel less judgmental toward the church, its people, and its imperfections. Heaven knows that I’m a work in progress too. Patience, Paul, patience. I’m staying, and I’m trying to contribute to making things better. I think God needs all of us to do that, if we’re really going to learn how to live together in a healthy, loving community with people who are very different from one another. I’m staying, and I’m trying to keep my heart open to discovering God, rather than defining Him. I know I have a lot to learn. I’ll hold to truths I believe, but not so tightly that I strangle the life out of them, or so tightly that I’m not free to embrace other truths as they become clear to me. I’m staying, and I feel free to find beauty and truth both in and outside of the church. God is claustrophobic, after all! I don’t believe He lives in a little box, nor do I believe that He puts many limits on where and how He shows up in the world. I often find Him in the church (even if I have to look obliquely at times). I definitely find Him in family and friendships. I find Him in the faces of people who are very different from me. I expect that I’ll find Him in many more places, experiences, and people in the future. I only want to have eyes that are open to see, ears that are open to hear, and an understanding heart that is able to feel His love in all of its manifestations. How is my path different from making excuses for the church? Am I just doing mental acrobatics to escape the dilemmas posed by my faith? I’m not entirely sure. But the evidence in my heart—greater peace, more connection, and more energy to do my life’s work—tells me I’m going in the right direction. I’m not driven by fear; I’m beckoned by God to dance with Him once more. In seeing the BIG canvas that God paints on, feeling His presence in my life has become a much more familiar experience. I’m making decisions that I can truly live with. I’m measuring my life not by how well I “fit” in any particular little box, but by how much I can E X P A N D — how much I can love, how much I can learn, how much of the divine I can experience, and how much goodness and compassion I can share with those around me. Do we all go through this thing ones or maybe few times in our life? Even though Jesus does so much for us every single day and I see them wit my own eyes and feel them; why then are there all of these questions and a longing for more or even a reality of what we believe, I have this question in my heart, who is Jesus to me?, without other peoples opinions and what we have learned! Why does this bother me so much? I was brought up in church, I always loved Jesus there wasn’t a turning day for me, I always believed and loved Him since a small child. Why all these questions then, is this my own fault? Does all this questions divide me from His greatness ? Or is it that I put God in this box as well? I Should give God space to breath!!! That is I why I feel I can’t! What you wrote is so powerful! Thank you for making yourself vulnerable. My wife found your article while looking up “Sigafus”. That’s my surname, too! We must be distant relatives. My great grandfather was John Sigafus, if that rings any bells. I have a brother Paul which makes your name even more intriguing. Would love to connect with you sometime. I found your blog through a mutual friend, Andrew Youngquist. I thought I recognized your name, we met at BYU and hung out a few a times :) Thanks so much for your open and heartfelt post. With all of the criticism of the church in recent years, I’ve been feeling weighed down in my own faith. It was just really good to hear about your experience, I so appreciate your honest and authentic approach to talking about faith and connecting to God in more expansive ways. I loved the poem you shared. What if I just opened up more to the Joy and Love I believe He wants for me? What if it was more of a Dance and less of a march? Some things for me to ponder on and smile about. All my best to you Paul! I’m so glad you’re doing what you love and are writing too! Hey Sarah! Good to hear from you–and I love your observation: “What if it was more of a dance and less of a march?” There’s something in me that awakens when I think about that possibility. A certain shattering of the rock that I create from you. As a professional it is probably easier for you to see the pain in others souls, but not so easy for me to see any pain in yours. Our faith is tested constantly. Sometimes we are pushed to our limits and it he stressors can linger for days, weeks, months, and years. That in my experience is what formulates a crisis. How we react and where we turn is what develops our characte. These trying times present unexpected opportunities to increase our testimonies. These challenges are exponentially more difficult when you don’t have a strong physical and emotional support system that forms a castle wall around us. My spiritual support came over me once I found the Church and Gospel and opened my heart and mind and let the spirit bore into my self-centered wall constructed with experiences which represented bricks of clay for my first 30 years..
Once I felt my cuppeth run over, once the truth seeped into my fibers, I stopped having any doubt of my faith in Heavenly father and his exemplar son. I have had a keen awareness lately of light and darkness. I have seen drug addiction pulling all the light and life out of friends. It is discouraging, disappointing, and tragic. It helps me see my own light. It helps me be stronger on my own path. I appreciate your humility in sharing your battle with darkness and courageous steps back into his light. You are a rock to many. As long as you hold to the true principles that the gospel can grow into your heart and soul your ship will always be headed for that seemingly elusive port which is the Celestial Kingdom. It will buoy up your testimony. It will shore up your testimony (puns intended) of him that created us and Loves us so much. The wonderful taste of the fruit of that tree in Lehi’s dream. The sun shines brightest when the day is ending. God’s shines his light in front of us and illuminates our path when darkness tries to blind us. We have to be outside of our houses (boxes) to receive the warmth and Love that is waiting for us. Thanks for your inspiring stories and lessons. Thank you, Paul. I love what you said: “We have to be outside of our houses (boxes) to receive the warmth and love that is waiting for us.” Beautiful! Not only have I been angry with how my upbringing in the church has only increased my sense of “not enoughness, and not goodenoughness,” I see how many of the doctrins and teachings in the faith system I grew up in seem to use shame as a power tool to get a desired behavior or control people. Bottom line for me, I found shame as a constant theme in the theologies i grew up in. For a person (myself) who grew up with a stong disposition of shame (shame proneness) even the scriptures themselves can be very shaming. Not only was God in a box for me but the very theological moorings –how I was taught to view myself (theological anthropology), and view why there is suffering (theodicy), became bankrupt for me. So Here I am. Stuck? Maybe. Riding the wave of Pauls courage. I see the importaince of staying in a community. Doing life with others regardless of beliefs, feelings, wounds, and storms, is something I truly value. But I did not stay. I am adrift. I am detached from the former shame provoking and sometimes shame cooptive systems that are embedded in the Churches I so loved. My problem is that I don’t trust God at this point either. I would like to find a theology that would help me put my trust back in God. 6 years of theological training has produced a formidable ability to dismantle my former impenetrable structures. So what do I know? At the risk of gaging myself with a Uriah Heepish false humility, I do know that I need to listen to my own bones. Maybe if they learn to sing I can begin to try to dance again. I’m glad that my words reached you in a deep way; I only hope that they didn’t amplify any shame for you. You and I both know how corrosive that can be. I also appreciate the risk you took by putting your experience out there, especially when you’re feeling adrift. I hear your yearning for community and communion, and I can really relate to how tricky it is to find that nourishment when you’ve felt betrayed by systems that have been hijacked by shame. p.s. let’s talk soon; I always enjoy being with you. p.p.s. Oh… and listening to your own bones; I think that’s a marvelous idea! Even if it’s hard. So beautifully written, Paul. I’ve found myself in that place too…questioning if I’m in the right spot or not…and I still find myself wondering. Thank you for being so vulnerable and sharing. You’re welcome, Teri! Finding a place where we truly belong is challenging. For me, there’s no single place where ALL parts of me feel at home; so I’m having to find a sense of belonging in more than one place – family, church, friends, community, poetry…. Paul – Thank you for sharing this with me. There is emotion, fear, anxiety, joy, quandary, hope and much more wrapped up in these thoughts. I need to give this some thought. Yes, Bob, there is so much wrapped up in this. And while I know that each person’s experience is different, I hope that my sharing will help others along the way. Thanks! This comes to me at such a prime time in my life as I seek ordination as an Episcopal priest. What brings people to church? Why do younger people feel that they are spiritual but not religious and why do others think they are done with church- the “dones” or de-churched? I think you bring up what God is really all about and that is love- asking questions, living the questions, and feeling ok not knowing the answers. Not even having a box, being creative in our ability to be present with God and allowing transformation to take place when we least expect it. Living through many losses and many joys in life, these circumstances don’t define me yet they help me seek a God who cares and wants to know the minutia of my life and my challenges. Having faith to me is about trusting in the midst of change and transformation whether in church or at home. God is bigger than we all realize and lives and breathes through each of us. Thank you for your vulnerability in sharing your faith journey and being open to building relationships and community in our search for a deeper relationship with the divine. I’m so proud of you, Katherine, in following your call to minister to others. Your depth of compassion is sure to continue to bless those you interact with. You bring up such good questions about “spiritual vs. religious,” the “dones” and the de-churched; it’s something I’m thinking a lot about, too (both regarding my own journey and the journeys of others). I also love your focus on openness; allowing space for our questions AND space for God to transform us in unexpected ways. Trusting in the midst of change and transformation…”: Your words and your encouragement mean a lot to me; thank you! Thanks for sharing your journey with us. It seems that to have a strong faith, we have to go through periods of doubt and questioning. Not a fun process, but rewarding when we come back to the core of who God and His amazing love for us. Everything else fades into the background. Yes, Michelle–I’m coming to the same conclusion: periods of doubt and questioning are part of the PROCESS of finding faith. Sometimes we juxtapose the two as if they are polar opposites, and that can lead to discouragement. I’m with you as well about how this process can turn us back to God’s love, and how other things become less important. Thanks so much for your comments! I’m glad that it resonated with you, Diana! I think we all do better when we have a chance to tell our stories and hear others’ stories as well. I’m guessing that we have a lot more in common with each other than we realize. I hope you’ll enjoy my upcoming posts! I loved your insight. I too had to take a second look at the way I was taught to view things w/i the church, but as I have I’ve grown to know a much more compassionate God. Have you seen the talk by brad Wilcox called “his grace is sufficient” on you tube? Life changing! Thanks, Lacy; my impression is that whenever I’m moving in the direction of understanding God as more compassionate, I’m probably going in the right direction. Also, thanks for that reference to Wilcox — I’ll have to check it out! Paul, thank you for stepping into such a vulnerable place to share these thoughts. I appreciate your honesty to your readers, and to yourself. I can relate to much of what you shared: for a little over a year, I was swimming through (drowning in) that panic that I might not fit anymore, and what that might mean about my life, and to my family. But like you, I’m staying. And I feel more real peace than I have, maybe ever. I still am lacking answers, and some things still seem a little fuzzy and irksome, but my relationship and connection to God has been revived and strengthened, and through that process, I feel that I have shifted from finding security from within my church community, to finding fulfillment in my relationship with God, as a loving, kind, and understanding being. Again, thank you for sharing. It helps to find others who have felt some of these things, but who have also chosen to stay. I can really relate, Jessica, to that shift of where you’re finding your security these days–in your direct relationship with a loving God. I’m glad that my experiences spoke to you! It’s so important for us to know that we’re not strangers or foreigners in our own community, and to find like-minded people who can support us in our ongoing journey. I’ll be posting again next week on this same topic. Such powerful important sharing, thank you. Yes, God does not live in a box. I so resonate with what you wrote about that. And about not living too long in ambivalence; it becomes a distraction or a box of our making. In reading what you wrote and the Hafiz poem, it reminded me of a version of the “Footprints” story someone told me years ago. Then the man noticed a pattern. At times in his life when he took a big risk, like asking his later to be wife out on their first date (as he was very shy then), moving across the country away from his family for his career, or when he stood up against a wrong at great risk potentially to himself, then the footprints went haywire. It was like he was chasing God or something. Then he noticed that it would happen when ever he was showing love in a vulnerable way or when he started writing poetry. What a beautiful story, Jim. Thanks for sharing it with me! And thanks for the encouragement, too. Stay well! Hello, Cate! I hadn’t heard of Rob Bell before, but it sounds intriguing… I’ll have to check out his work. I think we’re all hungry for real connection with the Divine (and with each other, for that matter); so I don’t think it’s a coincidence that a growing number of voices are speaking out about these very things. There’s a verse I love wherein Christ says: “Behold, I make all things NEW.” It sounds like you and I both are experiencing an awakening…. My love to you and your family, Cate. I’ll be writing more about this next week, so if you’d like a notification of my new posts by email, just let me know! Thank you, Paul. I recently experienced what I called a spiritual rut, and felt as though I was going through the motions of religion without feeling genuine faith. I prayed that I could understand God better and to know whether Jesus was really the Messiah and what it should mean to me. My search similatly resulted in feeling all kind of unity with all denominations of Christians as well as people of other religions entirely. I didn’t need to leave my church, but I needed to let myself out of all box to think clearly. I loved reading your story. That’s so easy to do, Kelly—at various times I’ve felt the same thing: like I was going through the motions. In our hearts, I believe we all yearn for something deeper. Something real. Something that changes us, and invites us to grow. I’m interested in your story; how your sincere inquiry led to expansion rather than contraction. We’ve probably never met, but I think we have a lot in common here. If you’d like, I can let you know when my next post on this topic is up! Just let me know… In the meantime, I wish you peace and curiosity in discovering God. My realization of no longer fitting into the spiritual life I had always imagined was very recent It has been hard. I will never forget where I was or what I was doing when it happened because it felt like something in me ripped. It was something I never expected. Luckily, my relationship with and belief in God have always been a sort of seperate thing from the church. I’ve never felt that I have to have the church to believe in God, and I have taken so much strength from that. I have, like you, decided to be more flexible. I step away on days when the pain of going to church alone is too much. I find those days are better spent at home appreciating my family. More than anything else, I focus more on love now than anything else. The days when I am at church, I find that my flexibility has brought some bravery to my usual timid interactions in class discussions. If I’m going to stay, and if the things I want to see change will ever change, I have to speak up. Finding new strength, flexibility, more love, and bravery are not a bad return on the pain I have been feeling. Thank you so much for this post. You perfectly say everything I have felt and wanted to say. Sorry for the lengthy comment. Lovely, brave, and oh so true. I love how you relate this crisis of faith to the other kinds of crises we face when something beloved doesn’t quite “fit” a new version of ourselves. Thank you Paul . Thank you, Ellen—not only for your kindness, but also for the inspiration that you share with me. I’m glad that our paths have crossed.